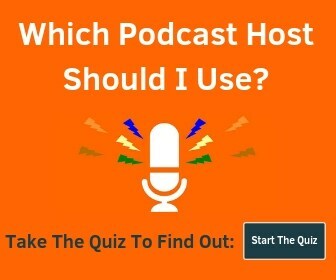 Because the best mixer for podcasting will vary depending on your needs, how many people are involved, your experience with audio equipment, and much more, I’ve broken up the recommendations into mixers that work well for single-person and 2-person podcasts, and recommendations for podcasts with 3 or 4 (or more) hosts. This is updated as of January 2019. One thing to keep in mind when deciding on an audio mixer is that you will need an XLR input for each person in the room or studio. Even if you’re doing a solo podcast, if you ever want to have a guest join you live, you’ll need a spare input and XLR mic for them. 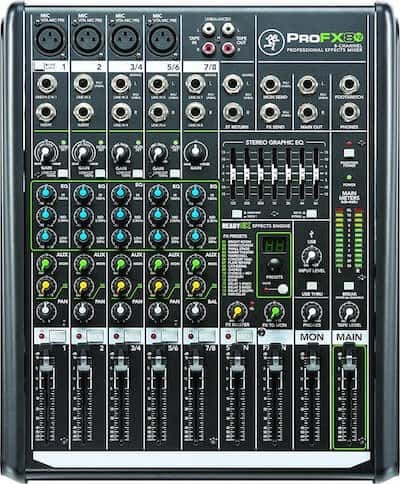 Because of that, I would actually look for a mixer that has more inputs than you think you’ll need. For example, if you’re doing a 2-host podcast, you should consider mixers from the multi-person podcast section. Some people might only ever have guests through Skype or phone calls, but you never know. I’m only going to include mixers that include a USB connection so you don’t have to worry about how to connect them to your desktop computer or needing additional equipment to get your recordings onto your podcasting laptop. USB audio interfaces are also popular ways to record on your computer (or connect to a mixer) but you usually won’t have the same control over EQ, levels, gain, etc. You will also want to strongly consider getting a multi-port headphone amp. This will allow you to plug in more than one pair of headphones (most mixers only have one or two dedicated headphone ports). 2 models I recommend are the Behringer HA400 and the ART HeadAMP4. They both allow you to control the volume of each person individually. You’ll need a balanced TRS cable to hook it up too. 4 XLR Inputs, 4 Headphone inputs, sound pads, automatic mix-minus, and more! Want more details on what to get? 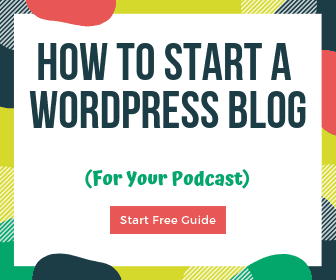 Check out the podcast starter kit gear guide & the how to start a podcast guide. Unless you’re on a serious budget, I would probably try to avoid these first two (just get a USB mic instead). I included them to give a full range of options though. The Behringer Xenyx Q502USB is a great budget option for a solo recording. But (and this a big but) this only supports 15V phantom power, not 48V phantom power which many mics require. This also limits your upgrade options severely if you want to continue using this mixer. The Behringer Xenyx Q802USB has input and output via USB, includes 2 XLR inputs, gives you 3-band EQ and a single knob compressor for the first 2 channels. This is still a budget model, but a slight step up from the single XLR option. You should take a look at the Q1202USB farther down the page as the price isn’t much higher, but you get more inputs and options. The Yamaha AG03 and Yamaha AG06 are the best mixers for solo and 2-person podcasting, gaming and livestreaming. They’re a step above the Xenyx line above. They include an easy to use “loopback” feature to add computer audio into your mix. You also get 1/4″ and 1/8″ headphone jacks. Compression and EQ is a single button and preset to a standard voice setting, although you can change those settings on the computer. One thing to keep in mind is that phantom power is only available on the 1st channel, so a condenser mic wouldn’t work on the 2nd channel for the AG06. This is a great option, check it out! 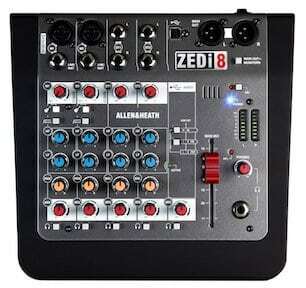 Allen & Heath is a well-known name in audio equipment and the ZEDi-8 is a great dual-XLR mic choice. It has very low noise, a 2-band EQ and a 2-in 2-out USB interface. The version linked here is an upgraded model that came out early 2016 (vs the previous version that came out around 2012). Not really a recommendation, but the Pyle-Pro PAD10MXU is probably the cheapest mixer you will find. If you’re on a budget, you could try this, but you would be much better off spending $20 more for the Q502USB above. Or just get a cheap USB microphone. 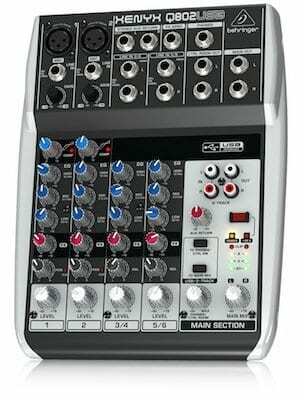 If your podcast is going to have 3 or 4 people and you’re all in the same room, you’ll need a mixer with at least 4 mic-level XLR inputs. There are quite a few options as many people have brand favorites or want various features. For the most part, these will from smallest to largest, and lowest price to highest. My favorite is the RODEcaster Pro Podcast Studio. 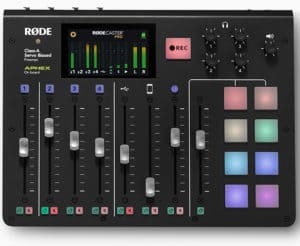 The new Rodecaster Pro is an impressive mixer that includes Bluetooth for phone calls, soundpads for integrating pre-recorded sounds, automatic compression, many other awesome features. You get 4 headphone inputs, 4 XLR inputs, faders, 8 soundpads, touch screen with tons of features, built-in microSD card slot, and more. I recommend you take a look at the Rodecaster Pro review for a more detailed look at all that’s included. 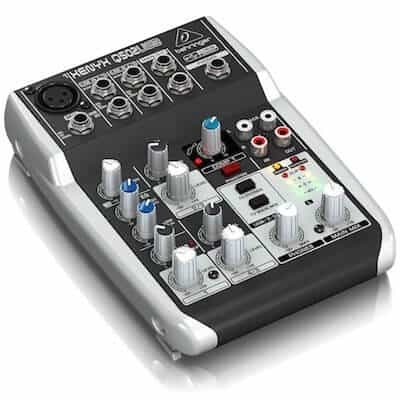 The Behringer Xenyx Q1202USB is the best budget mixer for 3+ person podcasting, but I would suggest taking a look at the 1204USB below too. A friend of mine recently got this mixer for his new 4-person podcast and they sound great. They had no prior audio equipment knowledge and were up and running easily. This is also the best mixer under $100. 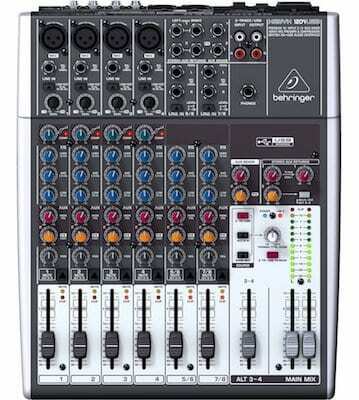 The Behringer Xenyx 1204USB is an upgraded version of the Q1202 above for about $50 more. This is one of my favorite entry-level mixers. It includes faders (sliders) instead of knobs for the volume levels, which are much more precise and easier to adjust. There is a Xenyx UFX1204 version that includes addition FX, Firewire and USB, and outputs 16 separate tracks. You can easily do mix-minus on one of the lines which allows you to mix in Skype or phone calls, but mute the audio back to them so they don’t hear themselves on a delay. 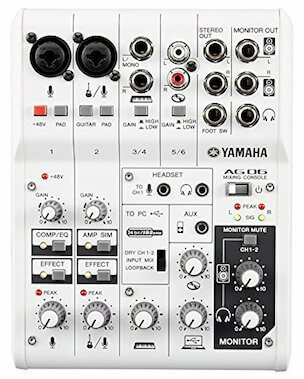 The functionality here is fairly similar to the Xenyx 1204, but the Yamaha MG10XU uses knobs instead of faders, which I see as a downside. 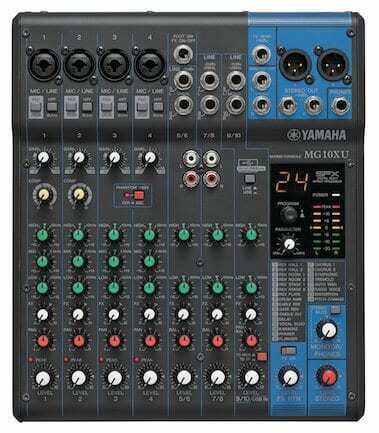 If you jump up to the Yamaha MG12XU with 6 XLR inputs, they give you faders, but the price jumps up too with better components. 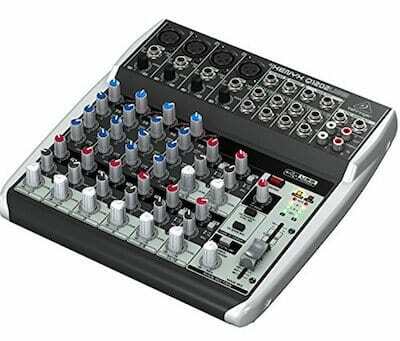 Otherwise, these include quality preamps and are an excellent choice for a USB mixer. They also have built-in sound effects that give you lots of live mixing options. 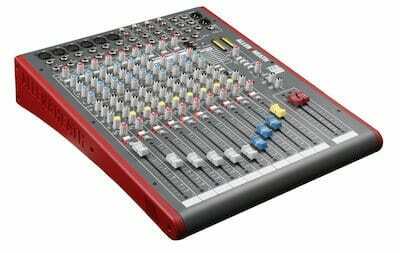 Great choice of mixer if you want to record spoken audio and instruments. The version without built-in effects doesn’t include the USB connection, so watch out for that when choosing one of these Yamaha mixers. 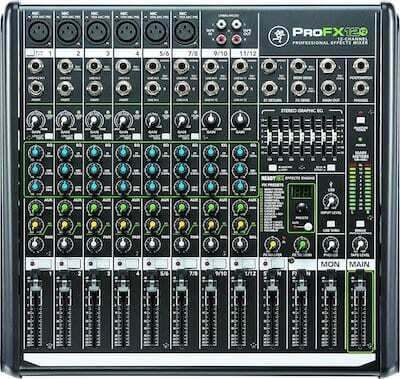 The Mackie ProFX8v2 gives you an excellent mixer for both recording and live performances. You get 4 XLR inputs with 3-band EQ, Aux/FX, Panning and compression control and faders. It also has a push-button 100Hz low-cut filter. Every channel gets 60mm faders so you can adjust levels with ease. Another awesome feature is the ability to switch between line-level and Hi-Z for the 1st channel. Hi-Z stands for Hi-impedance and allows you to plug a guitar or bass right into the mixer without needing to go into a direct box first. Note: Don’t get the smaller 4-channel version as it doesn’t have USB I/O. 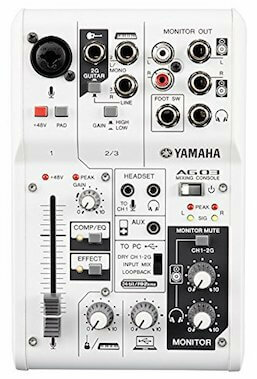 This is the best podcast audio mixer under $200 and what I would recommend most people get if they can. The Mackie PROFX12 V2 is basically a larger version of the PROFX8 above. Here’s the rack mount for this model. If you need a bunch of inputs, this will most likely have you covered. Larger version of the ZEDi-8. 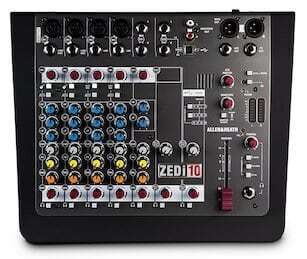 The Allen & Heath ZEDi-10 includes 4 XLR inputs, 3-band EQ, compression knob master fader. What really makes this unique among mixers in this price range is that it has a 4-in/4-out USB interface. That means you can output each mic to a separate channel on your computer for easy editing. The Allen & Heath ZED-12FX comes with professional 100mm faders, 6 XLR inputs, L/R main mix faders, 4 AUX sends, and of course USB I/O. It also has built in FX, great pre-amps, and more. You have the ability to get a rackmount kit for it as well. Very clean sound. If you want something that will last and grow with you, the ZED-12FX is your mixer. Best mixer under $500. 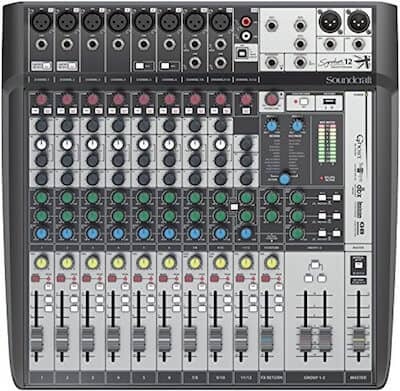 Lastly, but certainly not least, we have the Soundcraft Signature 12MTK. MTK stands for multi-track mixer which means you can record each track individually. You get eight 3-pin XLR inputs with Soundcraft Ghost mic preamps. Bonus: comes with Ableton Live!